I know it’s been quite awhile since I’ve done an At Any Age editorial, so I thought I’d bring it back this week! Sneaker-chic and sporty looks have been rampant this season, spotted in street style looks at each and every fashion week. Almost every designer has incorporated mesh fabrics, perforation, bomber jackets, sassy sneakers or some other kind of athletic look into their collections for spring and summer, so I figured it was a good time to include it in this feature! Which look is your favorite? PS – today’s the last day to shop the Friends & Family Sale at Shopbop and get 25% off everything! Some other pieces I’m still hung up on include this bohemian embroidered maxi by Candela, these matchstick post earrings, and these perfectly round Phillip Lim sunnies. What are you picking up? I’m leaning toward the 30’s and 40’s look the most. My mom and I just looked at this and we love all your picks! Fab post, Merritt! Sending this link to my mom asap! Love this post! 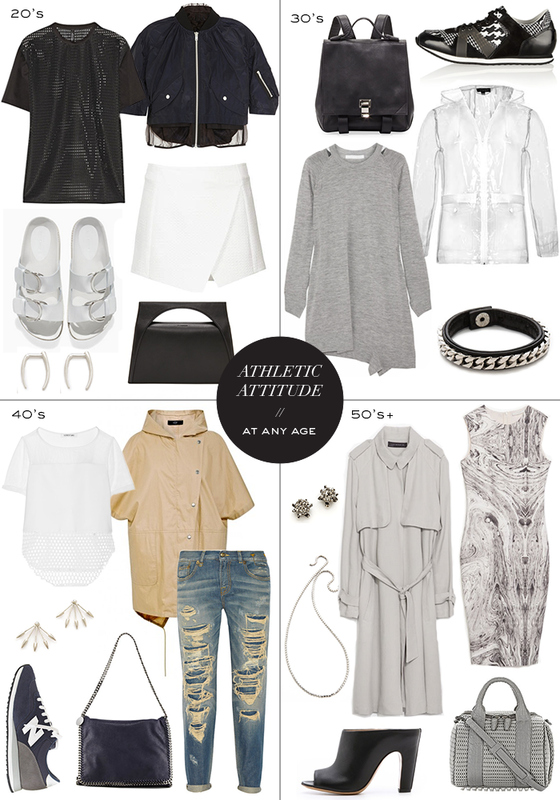 I love a good athletic attitude look – I would have to say though the 30s one is my fave! This is so perfect! I would rock everything in the 20’s for sure. I might be jumping the gun and aging myself my 20 years, but that Zara dress is so pretty! Love the marble swirl texture! Love this. What a great idea! Even though I’m in my thirties (exact number never to be disclosed! ), I really like the 40’s look. Especially love the Tibi jacket and J.Crew sneakers! I love this post – such a unique and great idea! Definitely loving the 30’s look!! I started following you because of your At Any Age edits (and your classic styling)… thanks for posting another great edit! I am a hip-to-it 47 yr old and LOVE the 40 look. Completely something I would wear. Keep the At Any Age coming – the ‘mature’ woman needs these ideas to keep current, but not dressing ridiculously trendy or matronly. I love the 30’s, which is lucky, because I still fit in that category for about 6 more months! Having said that, I’ll need to find some pants to go with that sweater(“dress”)! Thanks for all of these gorgeous options! Okay, so I know this is meant to make recommendations for each ag, but I would wear all of these. Great post! And Happy Easter! I love what you picked for my age group! Those sneakers are awesome! I have several pair like them! I’ll admit that this isn’t my favorite trend, but that sweatshirt dress looks unbelievably comfy. I love those little mesh details.